Winning submittals include intelligence about the client, careful planning and structuring of your messages and the ability to convey your firm’s difference. This program will walk through the strategic steps for a go/no go decision, intelligence gathering, the organization and delivery of any submittal. Bill specializes in helping architecture, engineering and construction firms with strategic planning, marketing and business development, communication training for technical staff, coaching and mentoring marketing personnel, client perception surveys, and client care programs. Bill has over 44 years of experience in architecture with the last 34 years focusing on business development and marketing. He recently retired as a Principal and the Director of Marketing at a Pacific Northwest leader in the architectural design of educational, healthcare, and institutional projects. Bill was a member of the firm’s executive management team that incorporated two offices in Seattle and Portland. As marketing director of the firm, Bill oversaw the strategic planning and development of marketing and public relations for the corporation and its offices. In addition to strategic planning, his role included market research, indirect market programs, promotion and communication, and direct business development. Bill received his Bachelor of Architecture degree from Kansas State University and his Masters in Public Relations and Marketing from the University of Missouri. Bill has been a member of AIA since 1973, a member of SMPS since 1982 and a Fellow in SMPS since 1999. He has repeatedly presented at conventions and seminars for organizations locally, regionally, and nationally. Bill’s working and speaking style is energetic, sincere, and passionate. 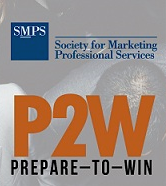 SMPS Prepare to Win virtual workshops are approved for 1.5 continuing education units for the Certified Professional Services Marketer (CPSM) program and 1.5 learning units from the American Institute of Architects per module. Nothing hurts more than spending too many hours on proposals and interviews that lose. Are you doing all of the “right things” with your proposal process to win new business but not seeing results? Do you even have a proposal process? This session explores the common mistakes that lead to proposals and interviews with no chance of winning new business. Virginia McCoy is a communications consultant with Ingenuity Marketing Group, LLC, in St. Paul, Minnesota. A former in-house marketer for a mid-size architecture firm, Virginia focuses on branded key themes and public relations that help engineers gain competitive visibility and improve their win rates. She explains the newest tools to enhance online marketing, including search engine optimization (SEO) and web analytics. She is also skilled at blogging and social media posts that engage more users. She has spoken to industry associations including the American Council of Engineering Companies (ACEC) and is an active member of SMPS-Twin Cities. This program will walk you through the 7 steps of a successful marketing plan for your firm. We will discuss the strategic process of each step providing examples along the way. These 7 steps can work for the whole firm or for a division, office or market sector plan. They also become the table of contents for the completed product. Understanding the structure of your firm, how marketing fits in and how marketing and business development are defined – is the first step to success in this industry. This session will discuss those differences plus cover your future career steps and how you can help technical staff be more comfortable in their role as business developers. Each module will consist of 75-90 minute online instruction, as well as additional resources. Module-related questions will be posted in the discussion board for individual practice and group discussion. Prepare to Win is approved for up to 4.5 continuing education units per module for the Certified Professional Services Marketer (CPSM) program and 3.0 learning units from the American Institute of Architects. Spoiler alert: it’s not about the money. Based on real-time data gathered from A/E/C firm leaders, HR professionals, and SMPS members, our presenter shows us what it takes to hire and retain the best talent to build your company brand, sustain a healthy hit rate, and set your firm apart. For marketing professionals, their day-to-day work has extreme highs and extreme lows; their efforts are the frontline with your clients and your other technical staff; and they’re a valuable piece of your precious overhead spend. Join us for this webinar as we focus on strategies to hire and retain best-fit marketers, while building efficiencies into your business operations model for sustained prosperity. Discover the top ten secrets to retaining excellent marketing talent. The demand for good marketing professionals is higher than ever. Finding good people and retaining them is critical to your businesses bottom line. During our February webinar, you’ll learn how to hire and retain great marketing talent—no matter what size your firm. Frank Lippert, FSMPS, CPSM, is the founder of Go Strategies. He provides strategic pursuit planning, market capture planning, and the functional seller/doer training to clients throughout the US. Lippert helps teams work more effectively and efficiently with processes, schedules, and tools that keep A/E/C firms’ business development strategy and marketing efforts on track. A good strategy and a focused approach to winning work with your target clients can save time and money, ease frustration, and lead to a happier workplace. Frank has worked at small, medium, large, and mega-sized engineering companies in his 30 years in the A/E/C industries. Now living in California, he works diligently to help up-and-coming marketing and business development professionals reach their full potential. The SF in SF330 doesn’t have to stand for Supremely Frustrating! If you’ve pursued a federal A/E services contract as either a Prime or Subcontractor, you’ve seen the Standard Form 330 (SF330). Love it or hate it, mastering this form is key to winning work with important government clients. Are you afraid your submission will be non-compliant because you didn’t precisely follow directions? Do you feel stifled by having to use the strict format required? Are you concerned about providing conflicting details from one section to the next? Don’t worry, our January webinar will show you all the steps to master the SF330. Done right, you can enjoy the process of submitting a proposal to be proud of! Join our presenter Danielle Feroleto as she walks us through the marketing planning process and discusses the approaches that yield the best results. Marketing is an activity that is critical to the success of your business. If you do not have a focused plan and approach to marketing, your efforts might look scattered, inconsistent, unprofessional and ineffective. Good marketing is the result of good planning and disciplined execution, and these two elements should always have a solid marketing plan to support them. From this session, you’ll come away with a commitment to developing a plan for your firm, an understanding of the components that provide clarity, and the measurable goals and activities recommended to build your firm's marketing. Even if you already have a marketing plan, this webinar is for you if you’re looking for tips to improve and refine your plan. Danielle Feroleto, CPSM, founded Small Giants in 2006 with a dream of changing the way that commercial real estate and A/E/C companies deliver their brand promise. Today, the full-service marketing and business development agency proudly supports clients in achieving their goals and visions to compete at the highest level. Feroleto pioneered the first marketing and business development course at the Del E. Webb School of Construction at ASU, where she has served as an associate faculty member for more than a decade. She’s also the author of, The Truth Helps: An Honest, Straightforward Guide to Project Interview Success. American Institute of Architects. Recordings of SMPS webinars are approved for 1.5 CPSM CEUs. An interactive virtual workshop series, Prepare to Win: Tech Tools, will provide you with the necessary skills to use three popular computer design programs: Adobe InDesign, Photoshop, and Prezi. It’s the perfect workshop to help build up your creative abilities, whether you’re a seasoned marketer or just starting your career. After the sessions, you’ll be able to take the techniques you’ve learned to beautifully format text, create proposals and presentations, modify existing templates, and edit or create logos, maps, and diagrams. This is a beginner-level class; experience in these three programs is not required. Marketers constantly juggle proposals, presentations, external marketing campaigns, and whatever else their team throws at them. However, in the A/E/C industries, marketers need our technical experts for input to get these tasks done. This extraction (sometimes referred to as pulling teeth) has easily become one of marketing’s toughest challenges. This session equips you with tools to get content from your technical team that will help complete proposals, project data sheets, blogs, case studies, papers, and other content marketing pieces. Join us for our November webinar and learn how to crack the code to extracting data from your technical team. Marketers constantly juggle proposals, presentations, external marketing campaigns, and whatever else their team throws at them. However, in the A/E/C industries, marketers need our technical experts for input to get these tasks done. In a world of continuous proposals and other materials, marketers don’t have time to beg for content, and they shouldn’t have to. There hasn’t been much insight into how to actually get that content from a technical team ... until now. If you’ve heard, “I’m too busy,” “I don’t know what to write about” or “Why can’t you do it?” when asking for content from your technical team, our November webinar is for you. This extraction (sometimes referred to as pulling teeth) has easily become one of marketing’s toughest challenges. This session equips you with tools to get content from your technical team that will help complete proposals, project data sheets, blogs, case studies, papers, and other content marketing pieces. We’ll discuss how to gain leadership buy-in, by working with specific internal personas and five methods marketers can use to extract quality content. Known for her reliability and humor, Danielle Gray is a Content Marketing Strategist with over seven years of industry experience composing proposals, writing content, running email campaigns, and generating leads online. Along with developing proposals, she helped her former design-build firm grow website visits by 88% and contributed over $150 million in revenue from leads generated from the website in just three years. Now, Danielle is the owner of DG Marketing Company, a professional services marketing firm committed to contributing and creating genuine, humanized marketing that listens and solves instead of tells and sells. She also speaks around the country about content generation, the importance of digital marketing and social media specifically relating to the A/E/C industries. her company in Atlanta, Georgia.